Fall in love with Tampa Bay! Let our guide lead the way through downtown Tampa, into Historic Ybor City, through the University of Tampa’s breath-taking campus and down Beautiful Bayshore Boulevard. Learn about everything from Tampa Bay’s rich culture to life now in a city exploding with new developments. See all Tampa has to offer, from the art of hand rolled cigars to minarets at the once Tampa Bay Hotel. And experience pirates, Cuban cuisine and more! Tampa is a city rich with history! Learn about the indigenous people and early settlers, pirate invading, cigar rolling, citrus farming and a cultural filled past at the Tampa Bay History Center. Explore the Tampa Museum of Art, curated with modern and contemporary art, as well as Greek and Roman antiquities. Take a ride on the Historic TECO Line Street Car and experience the Hillsborough River waterways on the Pirate Water Taxi. See Tampa Bay’s most iconic street art on a guided tour with a local Instagram Influencer! From Downtown Tampa and Tampa Heights to Hyde Park Village and scenic Bayshore, take pictures of and with Tampa’s popular murals, sculptures and more! 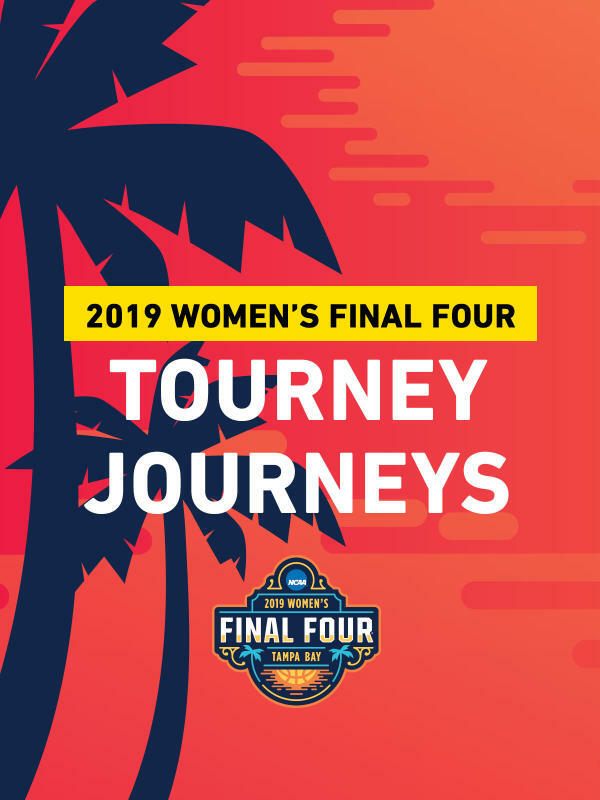 Get your perfect Tourney Journey photos at Tampa’s hottest spots with an official Women’s Final Four Basketball! The official branded basketball will make a great prop and will be yours to keep following the tour. Optional final stop will be available at Tampa’s newest hotspot – Sparkman Wharf. First, meet at the Unlock Tampa Bay Visitors Center & Retail Store. Venture through Downtown Tampa, Tampa Heights, Hyde Park Village and finally, to Sparkman Wharf. Stay at Sparkman Wharf on the bus to Tourney Town at the Tampa Convention Center. This tour ends at Tourney Town in the Tampa Convention Center. Embark on an unforgettable behind the scenes tour of Tampa! The Florida Aquarium welcomes countless visitors every day, but not everyone can receive one-on-one time with penguins, fish and The Florida Aquarium staff! Think you know the annual Gasparilla Pirate Invasion Parade held in Tampa? Meet members of the Ye Mystsic Krewe of Gasparilla and tour the Float Barn. And be one of the few to experience Amalie Arena behind the scenes. This behind the scenes tour is a Tampa day like no other! Don’t forget to bring your camera! First, meet at the Unlock Tampa Bay Visitors Center & Retail Store. Depart to meet pirates at the exclusive Float Barn tour. Next, enjoy a unique lunch at Amalie Arena! And then experience a VIP Florida Aquarium experience with animal encounters, concluding the tour at The Florida Aquarium. The key to life is adventure! And the key to adventure? That’s a Tampa Brewery Tour! Local breweries date back to 1896 in Ybor City, and with more than 40 local breweries now open in the Tampa Bay area, it is a craft beer tap takeover! The Brew Bus will guide and shuttle you to three local breweries, where you will receive a behind the scenes tour of each brewery, and one pint of a tasty local craft beer at each stop. Brew Bus Brewing will also provide craft beers onboard the Brew Bus. Want to explore on your own and visit the BEST attractions in Tampa Bay? Tampa CityPass is the hottest ticket at the coolest price. Take over Tampa Bay and gain admission to Busch Gardens Tampa Bay, ZooTampa at Lowery Park, The Florida Aquarium, Clearwater Marine Aquarium and the Museum of Science and Industry (MOSI) OR The Chihuly Collection at the Morean Arts Center. Visit Tampa Bay’s top attractions at your own pace, in any order, over a 9-day period. Oh, and skip all the ticket lines!